Who do you trust? According to The 2013 Edelman Trust Barometer, neither CEOs nor government officers (although businesses are distrusted less than government). There is a crisis in leadership: trust in ethics and morality of business and government leaders is very low. It’s not surprising then why majority (64%) needs to hear company information 3-5 times to believe messages. Trusted sources are (still) experts and peers. CEO and government officer are at the bottom of the list. 2/3 of the markets place their trust in banks below 50%. This trust deficit in banks is linked to culture. The causes of scandals are seen as internal and within the banks’s control ( culture of compensation and bonuses, corporate corruption, conflicts of interest). On slide 33, Edelman presents 16 attributes to building trust grouped into 5 performance clusters: Engagement, Integrity, Products and Services, Purpose, and Operations. For me, the big takeaway is the crucial and obvious role of social business strategy in reinforcing, amplifying, supporting, and developing each and every one of these trust attributes. Social can and must be used not only to nurture the trust of and manage perceived behaviours by the public, but also to build trust among the workforce and stakeholders. Relationship-building is essential in creating trust. Social should be at the heart of your influence, advocacy and community programmes. 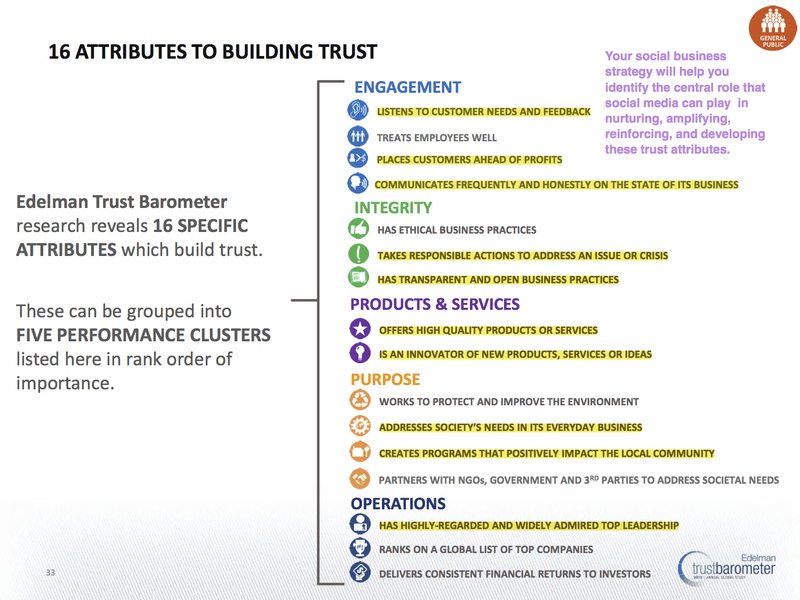 Social can be a strategic or tactical tool in the development of each and every of Edelman’s trust attributes. Below are a few broad examples. Under Engagement and Integrity, social networks can be (and is often) used as a platform for communication, listening, feedback-gathering and crisis management. Social layering can be used to create and improve the network effects in your organisation (Products and Services). Social technologies can help your organisation not only to stay in touch with customers and stakeholders, but use this relationship to solve problems (Purpose). Social media can be strategically used to facilitate the relationships between your customers and stakeholders, and in so doing, add value exchange among them (Products and services, Engagement, Purpose). Take the example of Dell: they are not into offering social business services, and yet they maintain a well-trusted Facebook page on Social Business, because they believe their customers and stakeholders can benefit from it. They’ve gone beyond solving problems and selling products — they ventured into creating shared value for their networks. Please share other examples or experiences you’ve had with using social in generating trust for your organisation or brand. Thanks!